(Chris Detrick | The Salt Lake Tribune) Ruth Watkins is introduced as the new president of the University of Utah at Rice-Eccles Stadium Thursday, January 18, 2018. Once her appointment is finalized, she will be the first female president of the state's flagship campus. 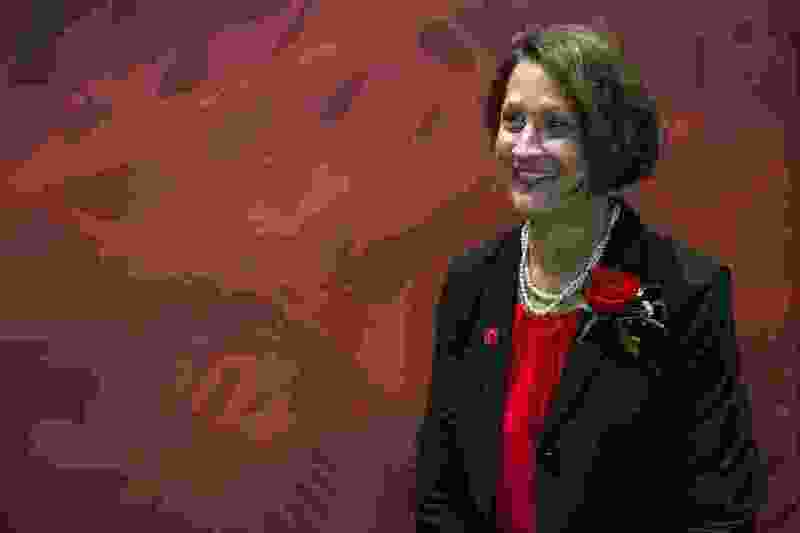 When the Utah Board of Regents chose University of Utah administrator Ruth Watkins to be U. president on Thursday, they also backed a vision for the state’s flagship university that is squarely focused on students. Watkins, U. provost and senior vice president for academic affairs since 2013, won unanimous support from regents to replace outgoing U. President David Pershing, who is stepping down to take a position on the U. faculty. With Pershing, Watkins — who has earned several degrees in speech pathology, focused on child language — also recently penned a kind of blueprint for the U. campus. In the document, “Clearing the Path: A Strategic Student Success Agenda,” she calls for an almost restless and multipronged campaign on campus to help more students get degrees, to make U. educations more affordable and to boost the institution’s profile on the national stage. That vision, she writes, is closely tied to the U.’s wide role in Utah. “We are driven to continuously improve the lives of all of our students and educators because the collective good of our state and region depends on an educated population,” says the 24-page report, signed by Watkins. Boosting the number of first-time incoming U. freshman and having more of them to live in on-campus housing. Diversifying the U. student body, with regard to both race and gender. Increasing student retention between their first and second years, partly by encouraging more of them to live on campus and develop a sense of belonging. Completing a new 100-bed residential hall on the U. campus by 2020. Helping students complete their degrees quicker, primarily by delivering more targeted guidance and advising services in their early years of study. Increasing financial aid dollars the U. offers and more closely matching scholarships with specific students’ needs. Identifying students who are less academically prepared, and giving them better support. Expanding the U.’s online course offerings to help with faster degree completion for students in rural areas. Recruiting award-winning academics to the U. faculty from around the world. Building more partnerships with community colleges and other associate institutions where students may start their academic careers before applying to the U. Along with wide-ranging recommendations on policies to promote student success, the planning document also calls for an increasingly data-driven approach to university strategies, relying on U.’s third-party data analytics contractors. The goal, the document says, would be to inform virtually every dimension of U. policy — financial aid, student advising, on-campus housing, graduation rates and other aspects of campus living — with data analysis.